It was extremely hard for us to find the winners because all of you really did a good job and we know that every singe of you put in a lot of effort. I am awfully sorry that we could only choose two winners :(. I hope even though you didn't win this contest, you wouldn't feel too disappointed...! and Yunita from Indonesia for winning the 2nd prize... :)!! You're Haku from France :)! Winners, congratulations one more time :). I will contact you via e-mail shortly regarding shipping. Casabento will send the prizes to your door in January. Congrats to all the winners awesome bentos. Lovely bentos, congratulations to all the winners, and I love those pink flowers!!!! A great idea! The bentos are beautiful! Congratulations to the winners! Congratulations to all winners! Your bento are really great! Congratulations to the winners - bentos are such a creative way to serve food - and such an opportunity for beauty! I'm always stunned at other's creativity! Sinta keren bgt sampe bisa ngadain Bento Contest . Congrats to all winners n jugdes yah ! yg poto Bento paling atas kreasi kamu ? btw g suka banget hadiah buat 2nd winner. Merry Christmas & Happy New Year Sin ! Congratulations to the winners! 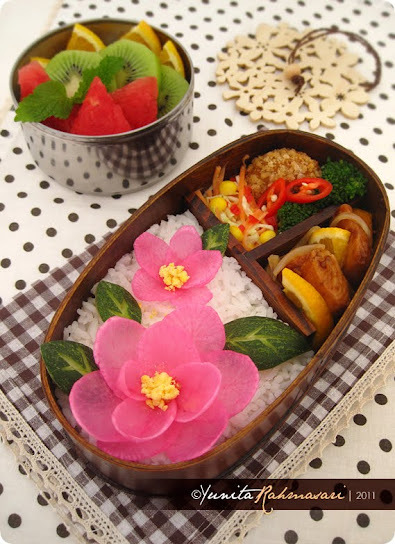 All bentos look delicious and creative. Everyone has bento making skills! Those of you who get to eat the benetos are so lucky! Wow!! 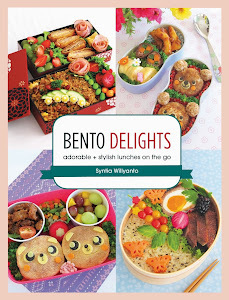 I can't believe I am one of the winners and so does my husband cause there are a lot of beautiful and creative bento entries. @Yunita Thanks for your kind compliment. Your bento looks really pretty and yummy. The pink daikon flowers are so adorable. Many thanks to CG, Nami,Lia and Casabento for this fun and wonderful contest. Happy New year everyone. What a lovely round-up! Congrats to all winners! Also wishing you and your family a very Happy 2012 and May the New Year be full of joy and cheer! Woahhhh these bentos are SO beautiful !!! Congratulations for the winners, and my best wishes for the others ! I looooove the one with the Daikon Flower. Yunita, your bento is full of grace, beauty, it's delicate and colourful !!! Really it is gorgeous, bravo !!! Oh and thank you to Cooking Gallery for organising this contest :) !!! Thank you to Cooking Gallery and to all the competitors. You did very creative bentos! Congratulations to the winners, you will receive your prizes soon. To all of you, CasaBento wishes you a happy new year! May 2012 brings you happiness, love and a lot of surprises! Congratulations! These entries were absolutely gorgeous! I noticed that a lot of participants used over 70% protein in their bentos... it makes the bentos look more tasty, but I hope that next time, IF another contest is held again in the future, the bentos will be more healthily balanced. It would be inspiring to see. This cookbook is available on Amazon and other online retailers. 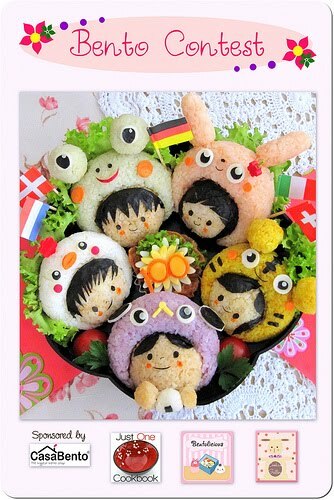 Please VOTE for my Bento Photos :)!! Copyright Cooking Gallery. All Rights Reserved.